Thanks to Austin’s extreme desire to be a city on the forefront of being green, I got a new compost container for 75% off! Austin is a little crazy about being green. While Meg was in town, she consulted on our yard design. Coming from the land of trees in Durham, she suggested we cut down an oak at our property line. We do have about 15 in our yard. Yeah, no way we can do that. We would get castrated. There is a long approval process the city requires before any oak trees can be cut down. To go outside the process would result in huge fines. A little crazy, but it comes with living in the best town in the world. On the flip-side, we did receive two free toilets. And now we have a fancy compost container. Austin has a three step process. Downsize to a 32-gallon green garbage cart. Take a free basic home composting class (which I did online). Purchase a home composting system and start composting. I then send in my receipt (and my “test” from the online course”) for the composting system and get $75 back. My composting container was about $100. All the reviews online regarding this composter seem to complain about the assembly. I bought it at our local hardware store, Breed and Co., who had it assembled already. What a deal! Scott and I love Breed. Sometimes they are marginally more expensive, but they have experts there to help find things and talk through projects. For us, this is invaluable. I think I will start composting in this new guy next week, after we have our beating of a big garage sale on Saturday. Come on by if you are in town! Saturday, 8-12. I’m tempted to join you in composting but I’m pretty sure that I won’t qualify for the check since we have not one, but two bigger gray trash carts that are full every week. I envy your “green-ness”! 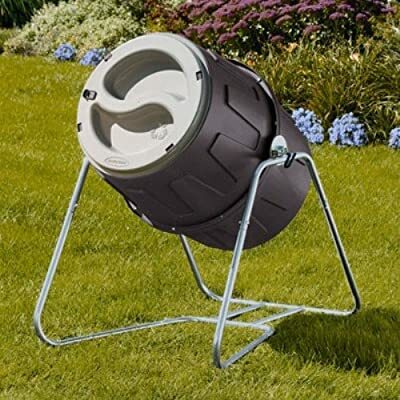 Im jealous of your new compost container- may have to look into one similar. Now if I can just get you to recycle too! I am recycling, Laurie! I have space now to do so and am delighted.